There's a good bet you'll be huffing and puffing on the mile-or-so climb up the mountain, but the exertion is worth it. From the summit you'll be treated to spectacular, panoramic views of the Hudson River. 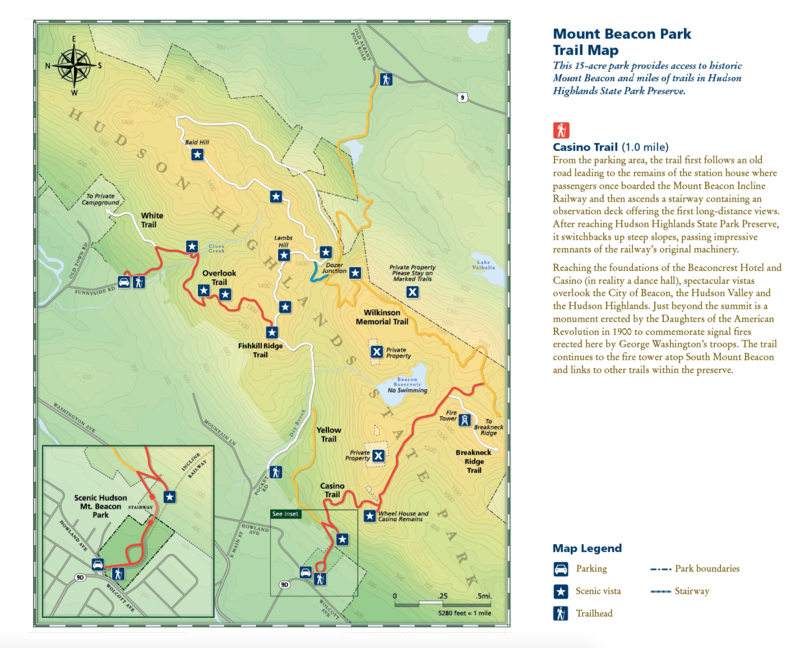 BEACON, Dutchess County (15 acres)—Yes, the trail up Mount Beacon is steep, but occasional switchbacks make the aerobic workout manageable. The hike actually begins on a staircase following the course of the Beacon Incline Railway, in the early 20th century the world's steepest funicular and one of the Hudson Valley's prime tourist attractions. (The Beacon Incline Railway Restoration Society is working to return the ride, destroyed in a 1983 fire, to its former glory.) Observation platforms atop the stairs preview the treat awaiting those who reach the summit — sublime vistas stretching from the Hudson Highlands to the Catskill Mountains. After a rest, you can explore the ruins of the incline railway's powerhouse or follow a short trail leading to a monument commemorating a signal fire built atop the mountain during the Revolutionary War. It was one of many beacons, spanning from the Highlands into New Jersey, intended to warn of British troop movements. (This one gave the mountain and city their names.) Just a mile from the summit is the restored Mount Beacon fire tower, where on a clear day you can see from the Big Apple to Albany. 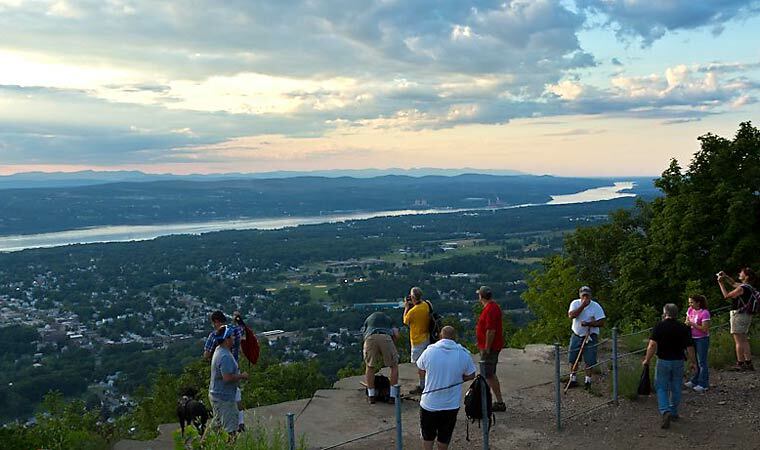 The truly adventurous can hike to the adjacent Fishkill Ridge—whose rugged trails afford long-range glimpses of the Highlands and even Manhattan's skyline—and to other portions of the Hudson Highlands State Park Preserve. Mount Beacon Park is maintained in cooperation with the Mount Beacon Incline Railway Restoration Society. The trail to Mount Beacon's summit, a shade over a mile and steadily uphill, follows a winding road that passes some lovely rock formations. Deer and other wildlife abound. Parking area and trailhead are located at the intersection of Route 9D and Howland Avenue in the City of Beacon. NOTE: Parking here is limited, additional parking at the Fishkill Ridge parking area at 35 Sunnyside Road.